Receiving objective feedback on oil painting can be essential for artist development, as working too closely to any work of art can cause issues to become invisible. A fresh eye or opinions of another will help bring these issues into focus. The focus of this article in this vein is an accomplished double portrait completed in Winton oil paints by Veronica Gaucher. This skillful double portrait has many strengths, of which one is the sensitive portrayal of the facial features. Here we can see the outlines of the eyebrows and sideburns have been blended out slightly into the surrounding flesh colour. Strategic blending is crucial for successful portraiture; harsh outlines of facial hair, whether hairline, eyelashes or brows can cause unwanted focal points in portrait painting but is not the case here. Subtle shading of the facial contours are also accomplished, and am guessing the artist has achieved this by the use of soft sables with perhaps a little glazing, although any soft material can bring about soft gradations in features. The artist shows high awareness of how the facial features fit together in a portrait which helps bring a good likeness to the subject. There are also no unwanted harsh outlines delineating the facial features such as the nose or lips. The artist has wisely substituted the background from the one shown in the photograph, as background clutter can rob all focus from the portrait. Cool colours might bring greater harmony with the warm skin tones as the existing reddish hue vies for attention. Cool colours are often a great way of bringing pleasing contrasts with warm skin colour. Suggestion might be a blend of ultramarine and burnt sienna to bring a cool indigo hue, blending with a little white to temper the depth in tone, although any bluish hue will do: cobalt or cerulean with burnt sienna or permanent rose with a little white. Moving the brush in various directions rather than in one direction will bring a more organic feel to the painting. Smoothing out the paint layer into a blurred background is also worth trying out. A little blending might be required around the outlines of the figures, to make them appear to belong to the setting as opposed to cut out. The artist has had to deal with colour casts which is a common problem in portrait photography. As can be seen here, there is a bluish tinge to the photograph but the skin tones in the painting has a more brownish-yellow bias. Perhaps a little more ultramarine and permanent rose might be needed within facial shadows to correct the colour balance. The pigment can be applied as a fine glaze from a fine sable on selected areas and blended out into the existing colour. The smallest amount of pigment with a little oil medium such as linseed oil will often do. 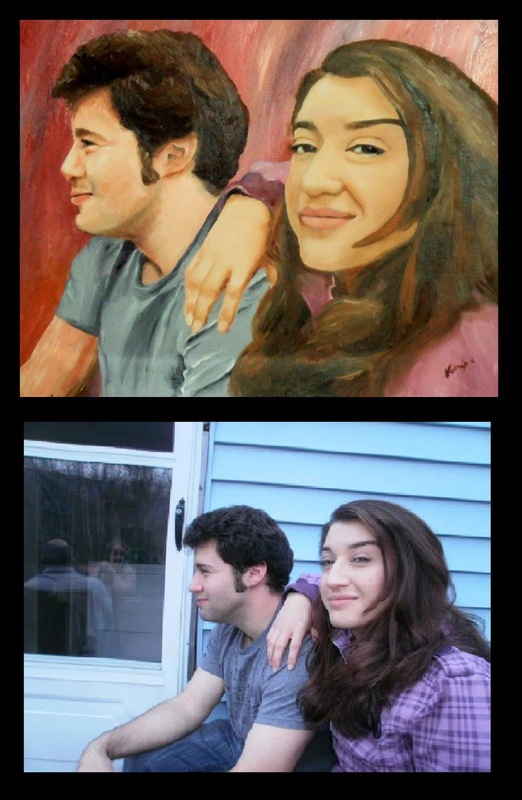 This process might best be practiced on a fresh portrait painting, so a comparison can be made with this one, and in case things go wrong. Hair can be a common issue in portraits, as it is often viewed as a separate entity to the face, when really comparisons should be drawn. A little blending of highlights might bring a softer feel to the brown hair in the foreground. I would recommend a little ultramarine, burnt umber and white. Drag a tiny bit of this cool pale colour like crayon around the highlight areas and blend out into the darker colour. Reinforcement of shadow colours will likely be needed around the darkest areas of hair to bring the tones into balance. I would recommend burnt umber, a little burnt sienna and ultramarine for the darkest areas of hair. Notice there is quite a lot of bluish hues in the hair which could be brought out. Colour bias too much in one direction can cause portraiture to appear a little flat, but could easily be put right here. More about painting brown hair can be found on my other article here. More about painting backgrounds to portraiture. And more about painting shadows in skin tones. Overall, this double portrait has many strengths, most importantly how the facial features fit together including subtle shading around the facial contours. These form the focal point and are therefore most crucial. A cool-coloured background will bring out the flesh tones and reinforce focal point upon the figures. A little soft blending from a soft sable might be needed around the outlines of the figures to make them appear to belong to the setting. A little adjustment to the shadow colours of the faces will counter the brownish cast to the skin; a small amount of bluish-violet hue, as described. Dragging a little dry paint into the highlights of the hair will suggest soft textures. Tonal readjustment will be needed in shadow areas, to bring it into balance. And then post your painting on my Oil Painting Medic Facebook page. More feedback on other paintings on the way!